A luscious mix of neo-classic striptease, daring and dangerous circus performances, uproarious comedy, variety acts, and stunningly choreographed group dance sequences, the Va Va Vixens are an entity of experiences that is sure to have you jumping out of your seats and begging for more! We bring the mirth and merriment of good old fashioned Voix de Ville like no other! As Louisville’s acclaimed Vaudeville-style burlesque and variety show, we feature a captivating cast of beautifully talented performers of all shimmies! The Va Va Vixens will take you on a wild and risqué ride into the magnificent world of sizzling striptease, ethereal aerial acrobatics and contortions, show stopping vocal stylings of our sultry songbirds, divine dancers, and outrageous antics! This is an ever evolving spectacle, drafted from scratch, so you will want to capture each tassel twirling season! Come play with us! Brought to you by the producers of sold out performances: "Va Va Venus", "Va Va Vamp", "Va Va ReVolutionary: A Tribute to Prince", "Va Va InVincible", "Va Va FestiVus", "Va Va adVenture", "Va Va Vunderland", "Va Va Vortex", "Va Va Valentine: A Fairie's Tail", "Va Va Variety, "Va Va Valentine: Sailing the Seven Seas of Love", "Va Va CarniVale", "Va Va Vices and Virtues", "Va Va Valentine", "Va Va Vittles: A Revue with Food", “Va Va ReVue: Naughty and Nice”, and “Va Va Vintage”, Art Sanctuary and The Va Va Vixens have returned for yet another original production with “Va Va Views from the Vault"! To any Va Va Virgins out there… Come experience what you’ve been missing! Whether you are looking for a girl’s night out or a romantic evening with your special someone, this is the show for you and you and you and YOU! We couldn't think of a better time to dedicate a show to the age old theme of love and beauty! Brought to you by the producers of sold out performances: "Va Va ReVolutionary: A Tribute to Prince", "Va Va InVincible", "Va Va Vunderland" and "Va Va CarniVale", Art Sanctuary and The Va Va Vixens have returned for yet another original production with “Va Va Venus"! A portion of the proceeds go to Art Sanctuary to help local artists! Art Sanctuary is a 501(c)3 non-profit status community-oriented arts collective supporting local visual, literary and performing arts through events, promotion and education. Founded on the premise that art is an integral part of life. Our mission is to help make it possible for artists to further their work and careers at a reasonable cost while helping to provide them with the platforms to do so. Our studios provide space where artists can work, rehearse, record, participate in classes, lectures, and exhibitions and take advantage of discussion, critique and collaboration. We want to cultivate a community of skilled professional artists with a reputation of pushing the creative envelope with results that put Louisville on the global artistic map, consistently providing a top notch experience for events, exhibitions and open studios. Prepare yourself for a night you will never forget! Brought to you by the producers of sold out performances: "Va Va ReVolutionary: A Tribute to Prince", "Va Va InVincible", "Va Va FestiVus", "Va Va adVenture", "Va Va Vunderland", "Va Va Vortex", "Va Va Valentine: A Fairie's Tail", "Va Va Variety, "Va Va Valentine: Sailing the Seven Seas of Love", "Va Va CarniVale", "Va Va Vices and Virtues", "Va Va Valentine", "Va Va Vittles: A Revue with Food", “Va Va ReVue: Naughty and Nice”, and “Va Va Vintage”, Art Sanctuary and The Va Va Vixens have returned for yet another original production with “Va Va Vamp"! Art Sanctuary presents "Va Va ReVolutionary"
Save the Dates. Mark your calendars! Brought to you by the producers of sold out performances: "Va Va FestiVus", "Va Va adVenture", "Va Va Vunderland", "Va Va Vortex", "Va Va Valentine: A Fairie's Tail", "A Veery Skeery HalloVVeen", "Va Va Variety, "Va Va Valentine: Sailing the Seven Seas of Love", "Va Va CarniVale", "Va Va Vices and Virtues", "Va Va Valentine", "Va Va Vittles: A Revue with Food", “Va Va ReVue: Naughty and Nice”, and “Va Va Vintage”, Art Sanctuary and The Va Va Vixens have returned for yet another original production with “Va Va InVincible"! 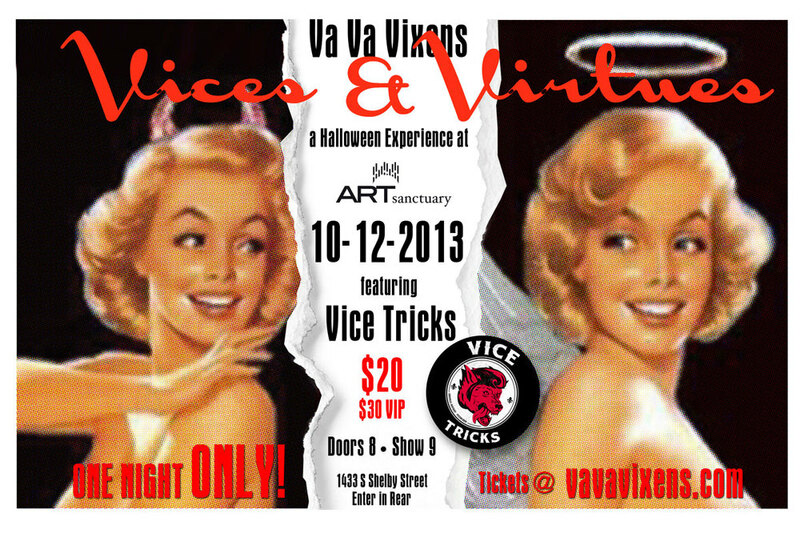 Art Sanctuary Presents "Va Va adVenture" with Va Va Vixens! Brought to you by the producers of sold out performances: "Va Va Vunderland", "Va Va Vortex", "Va Va Valentine: A Fairie's Tail", "A Veery Skeery HalloVVeen", "Va Va Variety, "Va Va Valentine: Sailing the Seven Seas of Love", "Va Va CarniVale", "Va Va Vices and Virtues", "Va Va Valentine", "Va Va Vittles: A Revue with Food", “Va Va ReVue: Naughty and Nice”, and “Va Va Vintage”, Art Sanctuary and The Va Va Vixens have returned for yet another original production with “Va Va Vunderland: Lose your head in the Madness"! Take a trip inside the rabbit hole for Valentine's. If you dare. Coming October 9, 10, 16 & 17! Doors 7, Show 8. At Art Sanctuary - 1433 South Shelby Street, 40217. TAKE A TRIP INSIDE OUR WORMHOLE!!! COME PLAY DRESS UP WITH US!!! Seating is LIMITED! First come first serve, however VIP tickets with reserved seating are available for 30 dollars. Must purchase four tickets at a time for VIP. $20 general admission. Purchase your tickets today at Headliners Music Hall. Seating is LIMITED! First come first serve, however VIP tickets with reserved seating are available for 30 dollars. Must purchase four tickets at a time for VIP. $20 general admission. Va Va Vices & Virtues - One night ONLY!!!!! Seating is LIMITED! First come first serve, however VIP tickets with reserved seating are available. Must purchase four tickets at a time for VIP.